The look on 10-year-old Keira Foy’s face and her “Are you kidding me? !” reaction to the unveiling of her new bicycle almost made irrelevant the logic-defying series of events that led to this emotional moment on April 30, 2016. At the center of this phenomenon was Southern Arkansas University, other than geography and a love of cycling, the only thing connecting Paralympic cyclist and philanthropist Scott Wells with the Foy family. 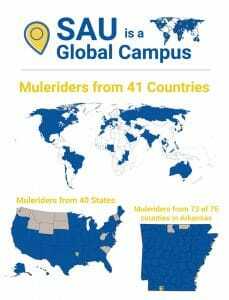 Wells is a member of the Mulerider family as an alum (’88) and the Foys are joining SAU as Keira’s older sister, Micayla Coco, is an incoming freshman this fall. A few months prior, Keira was wide-eyed when she joined Micayla and mother Patsy Foy on a tour of SAU’s campus. As they walked through the Reynolds Center, Keira became enamored by SAU beauty queen Haley Bird, who was adorning her Miss SAU crown for a function. Keira was born premature at 23 weeks, which caused some challenges including cerebellar hypoplasia, which means she’s missing the right side of her cerebellum and part of her brain stem affecting her balance and stability. 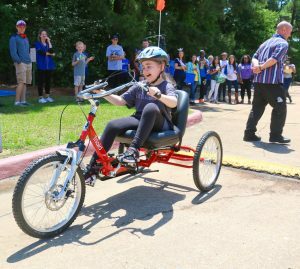 The bike giveaway would put Keira among other children in need across the U.S. vying for 600 adaptive bikes, with online votes determining winners in various categories. “I have problems riding my own bike. I usually wobble, and my feet can’t peddle,” Keira explained to KSLA. SAU President Dr. Trey Berry and others from campus saw the story on the news with Keira and her SAU t-shirt. 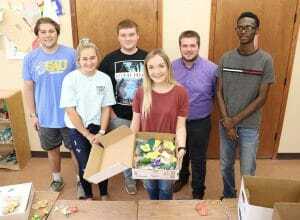 Campus personnel had also recently seen a similar feature in Shreveport about Wells and his non-profit, Independence Regained, with one of its missions being to help supply adaptive bicycles for those with spinal injuries. It seemed a perfect fit, and SAU contacted Wells to see about matching him up with Keira. Wells had received other calls from his para-cycling friends interested in helping Keira. Before long, Wells visited the family and met Keira. Unbeknownst to the Foy family, SAU sent Wells’ organization $1,200 towards the purchase of a Triaid Tracer Junior. This three-wheel custom adaptive cycle is made to allow her to finally be able to ride without a helping hand for balance or movement. “Everybody can remember the first time they rode a bike, and I want her to have that memory,” said Patsy, who was overjoyed to call to withdraw Keira from the nationwide bike giveaway because support from SAU and Independence Regained was taking chance out of play. 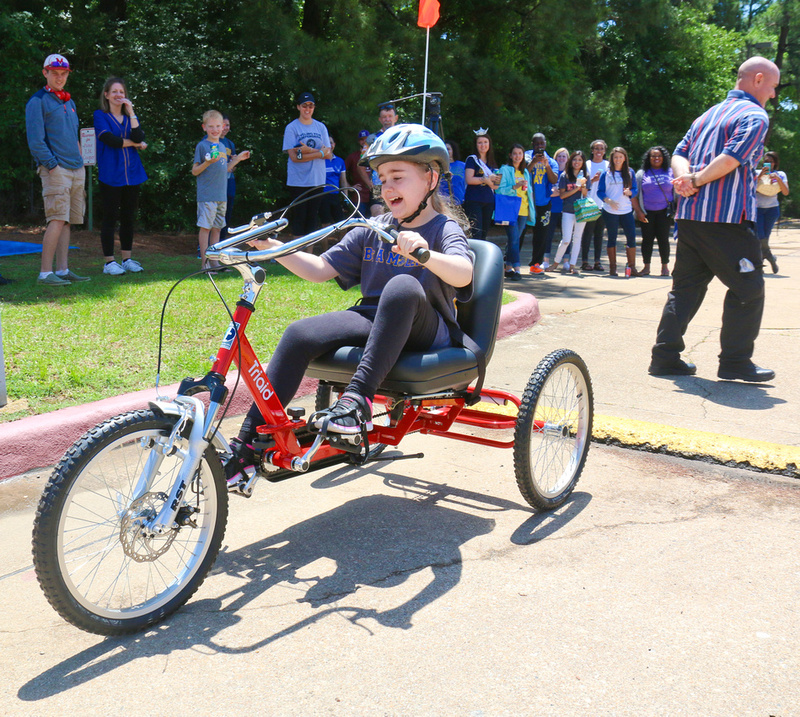 On April 30, Keira thought she was just joining her family to cheer for Wells and other adaptive cyclists as they crossed the finish line on a fundraising ride in Shreveport. Even when a busload of SAU students and staff unloaded, Keira’s suspicions were not heightened. She remained her normal bubbly self, fearlessly playing and engaging with everyone there. When a KSLA cameraman arrived, whom she assumed was there to film Wells, she darted to him and his professional equipment. She had recently taken a passion for video production, borrowing family phones to produce videos of her and her toys. He was there, of course, to film her ride a bike for the first time. Wells returned from his long ride, and after downing some water, it was time for the surprise everyone had waited for. As Keira took a reprieve from the sun in her family’s van, the bright red bike was brought into position in a circle of SAU and cyclist supporters. Even when Keira came within feet of the new bike, the innocent and humble Keira made no assumption of what was about to happen. Wells spoke up and presented her with the news that made her squeal with joy as onlookers cheered (and fought back tears). In a flash Keira was perched smiling on her bike. Pushing forward on the pedals, rather than down as on a standard cycle, allowed her to power a bike for the first time on her own. The crowd roared. Her momentum just started to gain as her first challenge was presented in the form of a speed bump. The first few efforts saw the bike’s front wheel retreat, but the energy of the crowd and her soaring spirit pushed the bike up and over. The crowd erupted. Wells transitioned back from his wheelchair to his racing cycle to join Keira on a celebratory first ride. Afterward, the SAU contingency congratulated her with high-fives and gifts, including a wide-array of SAU t-shirts. Wells is a former Mulerider baseball player and ten-year Navy veteran who served as a search and rescue swimmer. After transitioning from the armed forces he was working as a corrections officer in South Carolina when an incident changed the direction of his life. He was monitoring inmates as they collected trash along the interstate when a drunk driver slammed into his parked van, cracking three of his vertebra and giving him a C-5 spinal cord injury. He worked his way back to relearn how to be independent again, and a few years later returned to Shreveport where he was born and raised. In July 2010, Independence Regained was founded by Wells, who has served as president and CEO ever since. 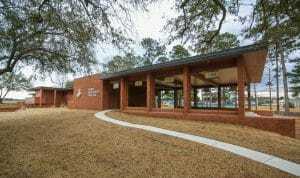 The group is advocating raising funds for an all-inclusive neurological rehab facility to be built in Shreveport/ Bossier with group’s mission to rehabilitate, educate, integrate people with spinal cord injuries, traumatic brain injuries, and other neurological disorders back into all aspects of an independent life. Wells recently had the prestigious opportunity to compete in the Olympic time trials held in Charlotte. He was not able to qualify, but per his normal upbeat attitude he said he’s got four years to train for his next attempt. He and Keira met up recently for another ride before he left for the trials. He bragged on her ability to ride around the one-mile bike path. He said the Foys have also come out to participate in a fundraising he held leading up to his competitive travels.